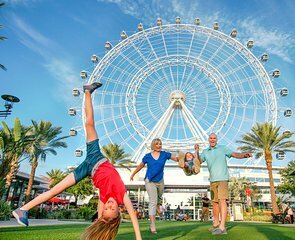 Observe the city’s most famous landmarks from above, during a 23-minute rotation around Icon Orlando. A great experience for all ages, the air-conditioned capsule offers exceptional views of Cape Canaveral, downtown Orlando, and Floridian forests from 400 feet. Open from 10am to 10pm, you can enjoy the city landscapes whenever it works for your schedule. Upgrade your experience to include a glass of champagne and priority boarding for your group. Please note: hours of operation are subject to change without notice. Additionally, to ensure great viewing opportunities, entrance to the Icon Orlando may be limited in the case of inclement weather. It is strongly advised that you confirm hours of operation prior to your date of travel. We loved our visit to the Orlando Eye. Very peaceful, beautiful view, nice slow movement, private air-conditioned area, and lovely smiling employees. Thank you! Very nice complex of 3 attractions. Orlando Eye was closed due to maintainance. We have been told it will open in a couple of days. This maintanance was not mentioned on the Web site. We found out after traveling there. OK for 1st time, but not worth it going again and again. very nice ride and beautiful view. Great! Both of us are scared of heights, and we are so glad we did it. We really enjoyed our experience. From previous reviews I thought it took quite awhile to make one rotation. But it was only about 20 minutes. There was great music playing and the views were awesome. My whole family loved it, we also did the Madame Tussauds wax museum and we enjoyed it very much.